This is a concept well known in photography. The better you know a subject, the better you can photograph it. I grew up playing ice hockey so I feel the most comfortable and confident covering high school and pro games. I follow the flow of a game and position myself to photograph the best action. 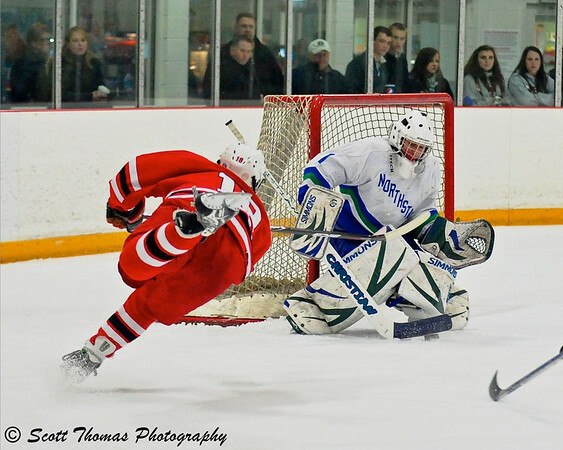 In the game pictured below, the red team was down by two goals at the beginning of the second period. I had a feeling they would come out flying and create good scoring opportunities. The red player scored on this shot as the puck slide just under the goalie’s stick in the first minute of the period. Ice hockey is a fast sport and knowing the game helps a photographer get into position to capture the action. Nikon D700/70-200VR, 1/500s, f/2.8, ISO 6400, EV +1.3, 82mm focal length. Baseball is a sport I know and played but am not a student of the game. Every game I photograph builds on my knowledge and experience. Like anticipating when a batter will swing. When the sport has a ball, puck or snitch, it is best to get the ball in the frame or, in this case, on the bat. 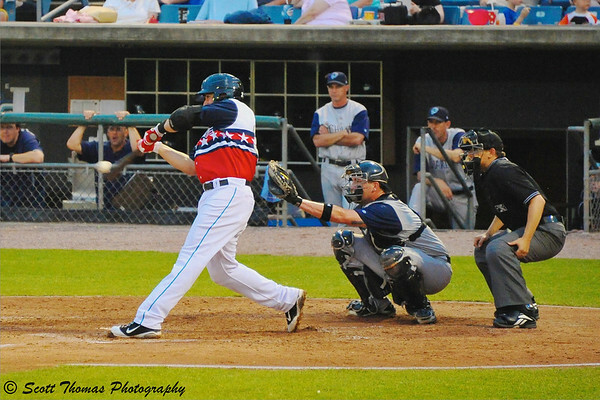 Getting the object of the sport in the photo is very important like the baseball the batter is hitting here. Nikon D700/28-300VR, 1/500s, f/5.6, ISO 6400, EV +0.7, 300mm focal length. This year I am learning to enjoy and photograph the sport of box lacrosse. Another fast sport like ice hockey. Lacrosse sticks have nets where the game ball is carried during the game. Players are wizards at using their sticks to carry, pass and shoot the ball from various angles. After a few games I started to recognize the moves of the players and anticipate the action. The first few times I was following a player who would suddenly put a shot on goal by going over his reverse shoulder, I totally missed it. I was determined to catch this stunning move and did after many attempts. Anticipating the play like this over the shoulder shot by a lacrosse player is part of a sports photographer's learned skill. Nikon D700/70-200VR, 1/800s, f/2.8, ISO 8000, EV +1.0, 200mm focal length. Practice is important in any sport as it is in photography. The more you photograph a sport, the better you know and understand it. The better your photographs of the sport will be. This entry was posted in Photography, Sports and tagged 28-300mm, 70-200mm, baseball, bat, batter, box lacrosse, catcher, glove, helmet, ice hockey, nikon D700, players, puck, stick, umpire, vr. Bookmark the permalink. Great post and thanks for the reminders! I’ve never tried photographing sports, but I can certainly understand the challenges. Gret shots! I never fail to be amazed at your crisp sports photos. Knowing how easy it is to get blurry shots, your work is really impressive! Thank you, Kathy. Every time out is an opportunity to get better. 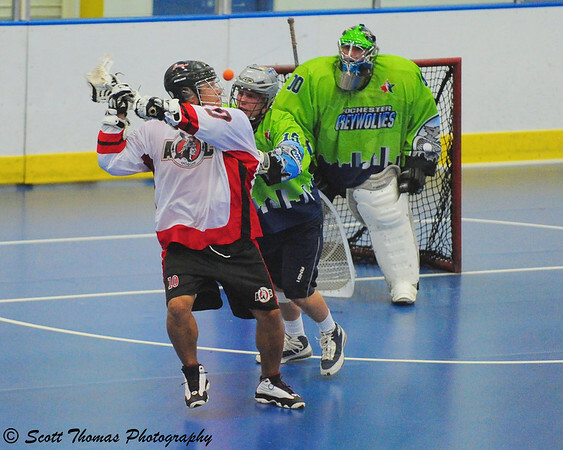 I’ve never seen box lacrosse before, it looks like something fun to watch and also photograph. Sports are not something I normally find myself drawn to photographing, (unless I am lucky enough to be at a Red Sox game, but even then my seats are not usually close enough for a good action shots) so at first I wasn’t going to comment on this post – althought I think you have done a fabulous job schooling yourself in the type of shots you want to take. But after I caught your “snitch” and “wizard” references, I thought you’d appreciate knowing another Harry Potter fan got a little chuckle this morning. Hey, someone caught it. 🙂 Thanks!